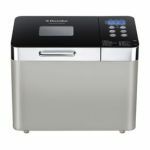 Fully automatic bread making machine: Mixes and kneads the dough, bakes the bread and then switches automatically to the keep-warm function (so the bread stays delicious and crusty). Always fresh bread to suit your taste. Also ideal for special diets. Capacity: 900 grams. Colour of the crust adjustable: light, medium or dark. 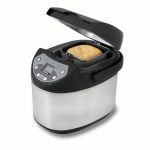 With 8 digital programmes, fast button for special short programme, timer (wake up to the smell of fresh bread! ), warning signal for the moment to add special extra ingredients such as raisins ans nuts, large LED display, viewing window and removable bread tray. Includes measuring scoop and beaker. 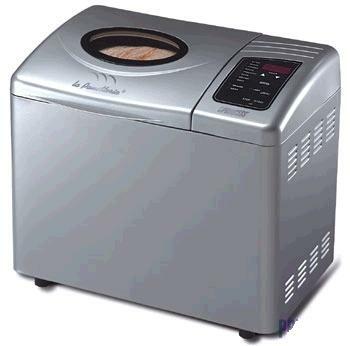 This fully automatic bread maker ensures that you will always have fresh bread around! 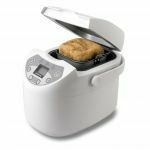 Thanks to the timer, you can even set it so you wake up to a freshly baked loaf. Crust colour can be set to light, medium and dark. Features 8 digital programmes, a hotkey for a special shortened programme, an alert signal to remind users when to add any special ingredients to the mix such as currants or nuts, a large LED screen and a viewing window.